It’s official! A new Firestorm series is coming our way from Ethan Van Sciver, Gail Simone, and Yildiray Cinar!!! DC Comics announced this information today on their blog DC Universe: The Source. Below is the cover to issue #1 by Ethan Van Sciver (click the image to enlarge). They didn’t specifically state if it’s an ongoing series or when it will ship, but based upon other solicitations it’s most likely an ongoing series and will ship in September. It’s been a long time coming, but we’re finally getting a new Firestorm series! My thanks to Keith Baker, Brandon Leonard, and Jeph Remley for the fast heads-up! Lots to discuss and digest on this before I start to analyze and comment. We’ll chat again soon! It’s true. Ethan and I are co-plotting, and I am scripting, a new FURY OF FIRESTORM book that is honest to god one of the best things either of us has ever done. The art is by Yildiray Cinar, who is SLAYING IT. Lots of books are electric. This thing is NUCLEAR. It’s a MONSTER. I am dying for you guys to see it! [responding to a question about who Firestorm is going to be at that point] I can’t say who. But…damn, guys. I know you get inundated by hype all the time. The book is the real deal. Remember when Green Lantern just exploded? Now it’s Firestorm’s turn. I am SO EXCITED. This afternoon Bleeding Cool posted a second image of the new Firestorm. I was planning to post the image here, but Bleeding Cool was asked to remove the image of the new Firestorm. I’m assuming the creators don’t wish that image to be posted at this time. Therefore I’m going to refrain from posting it here. I’m sure you can Google it and find it elsewhere if you’re desperate. Thanks for the keys to FIRESTORM, DC Comics. Gail, Yildiray and I know how to drive. Yildiray Cinar is the next Ivan Reis. I kid you not. “@GailSimone: The other is the Fury Of Firestorm.” Awesome — DC couldn’t have picked a better writer to revive him. Rafael Kayanan (one of the classic artists on the original Fury of Firestorm series) also wished congratulations to Gail Simone and Yildiray Cinar on Twitter. At one point, #Firestorm was even trending on Twitter! Amazing! A truly wild and crazy day! For additional reading on other newly launched titles, I recommend checking out my fellow bloggers: The Aquaman Shrine, The Idol-Head of Diabolu (a Martian Manhunter blog), and Being Carter Hall (a Hawkman blog). Posted in: Comic books, Ethan Van Sciver, Firestorm #09: New 52 v1 (Firestorm Protocols), Firestorm comic vol. IV, Gail Simone, Jason Rusch, Ronnie Raymond, Yildiray Cinar. This is the best news EVER!!!! I feel like I won the lottery today. I knew there was a reason VanSciver posted on Facebook that he bought the full run of FoF on Ebay recently. That coupled with him saying that he was working with Gail on two projects…I knew one had to be Firestorm. Huh? What? I’m assuming this will be part of DC’s reboot to their Universe, yes? – Jason’s emblem fills one of the 6 circles on the “Mega-Firestorm’s”(?) chest. 4 are blank and one looks like the LSH’s Sun Boy logo. Ronnie doesn’t seem to have a logo, but the Sun could be his. Does this mean that up to 6 people could form the new Matrix? – Is it just me, or does “Mega-Firestorm” look like a cross between Kodama the Sun Killer and Wildfire? (Both also from LSH……Maybe I’ve just been reading too much LSH lately. That’s 3 references). Does this mean Firestorm’s powers will change? I also ask this because of the description from the new Captain Atom series that says he is “charged by nuclear energy, possessing vast molecular powers.” Sounds like Cap Atom is co-opting our favorite Match Head’s schtick. – I’m still holding out hope that a certain Nobel laureate we all know and love will appear in the new series, if only in a supporting role. wow not sure how i feel about the costume redesign i thought the brightest day one was the best yet but I’m not about to start complaining with the creative team attached to this. 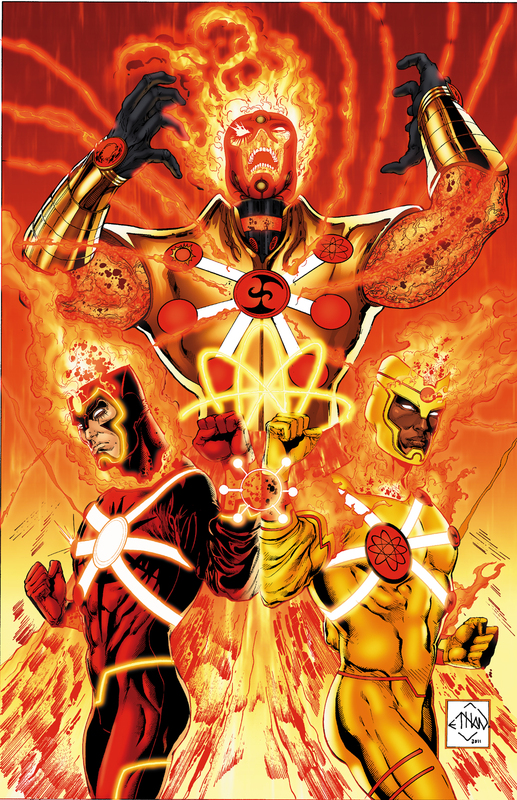 now can we just get firestorm …firestormS?…into the JLA!! I already told you I’m skeptical about this new look – it feels like a bit too much change, a bit too busy in appearance. But even too-busy Firestorm is better than no Firestorm, right?!?! Woo hoo – skepticism aside, I’m looking forward to this! I think you guys are going to be very happy. Firestorm is going to be HUGE. Thank you for keeping the Firestorm flag flyin’! Gail – Thanks so much for visiting and commenting! It looks like a wild re-imagining! A whole new generation now has the chance to fall in love with the Nuclear Man like we did. You’ve got a real super-star team working on this book! Plus, your own enthusiasm for the project is infectious! Can’t wait to read it! Skeptical about the costume redesigns on the cover, but I’m a fan of Ethan van Sciver’s work, so right now it’s kind of a wash.
I’m loving the creative team here and have very high hopes for this book (while quietly hoping Gail and Ethan’s other “secret” project is Plastic Man or Black Canary related). During the C2E2 convention in Chicago, I went on a Firestorm spree! I picked up Firestorm’s original series and the entire Flash back up stories (I enjoy a good quest at a con ). And the DC Comics Presents issue that reprinted some of the latest Firestorm series with Jason. I even picked up the Firestorm Toon Tumbler while I was there. Now I can add a new series to my pull list! Thanks, Gail, for bringing your immense talents to Firestorm! I just creamed my jeans! bleeding cool has the initial costume design by EVS but i gotta say , it looks nothing like him, the two mini firestorms( that’s what I’m calling them) look more like the real thing but this new firestorm has very in common with the original why does he need a skull for a face and lava arms. its look like a mash up with Cameo and Ghost Rider! the team looks amazing but i figured EVS would have come up with a design closer to what firestorm has been, hes had many resigns but they never look so vastly different from each other. sorry had to vent! When I first learned about the reboot of the DCU I was skeptical to say the least, so much so I’ve been walking around in a funk the last couple days not sure what to think. But now … if this is the change, change is good! That is the most talented team of creators to ever fuse with Firestorm. I can’t wait for it to begin! @Gail – I am a huge fan of your work and love reading all your books, mostly Secret Six and Birds of Prey but I’m positive your take on Firestorm is going to be my new favorite. I can’t wait to see what you and Ethan have up your puffy sleeves. @Shag – I’m willing to bet you’re just like me right now and your mind is blown by this news. BLOWN! Awesome! Best thing about this is that with Gail on board, there should be plenty of room for humour (Firestorm should be fun, dammit). Not aware of anything Ethan’s written since his CyberFrog days, but I used to love that so here’s hoping. Things like costume, Ronnie being a student again etc I don’t care too much about. Things always change, I just want to read cool stories about characters I love. I really can’t wait for this. We’ll see how it all goes! I’m excited by the creative team, but my enthusiasm’s tempered by the illoes we’ve seen so far. So nice to see Ms. Simone make her presence known here, showing she’s in touch with the Firestorm fanbase and cares what we think. I put up a special edition of my recent “Storm Warning” series over at my blog on this, pretty much reiterating what’s already been said. Can’t wait for September, that’s for sure! Posted updated with a few more social media comments from creators, and news about a second Firestorm image. Firestorm is just a burning match? WORST REDESIGN EVER! Just kidding (I am basing this on the Bleeding Cool “replacement” image ;-)). Not sure what to make of all this just yet, as I am about the DC restart in general. Not really won over by the “Mega Firestorm” image (as someone said, too Ghost Rider). But who knows? At first I didn’t like Jason Rusch all that much, but he grew into a great addition to the FS mythos. I’m just hoping for something traditional is all. How is the DC reboot going to happen, anyway? (I am a bit out of the loop) Is there gonna be another continuity warping story arc?